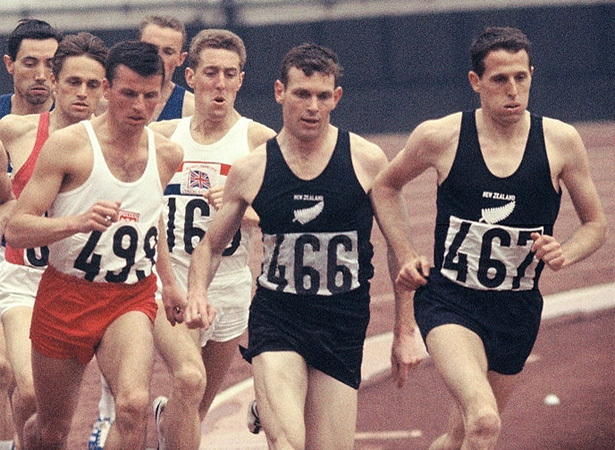 In the eight days leading up to the Olympic 1500-m final Snell had already run five races: the heats, semi-final and final of the 800 m – in which he won gold – and the heats and semi-final of the 1500 m. Joining him in the 1500-m final was Kiwi teammate John Davies, who just made it through his semi-final, placing third. The field for the 1500 m was initially led by Michel Bernard of France. He fell back after 400 m and for about 200 m there was a lull. Then Davies took the lead, with Snell behind him, fluctuating between second and third place. At one point Snell found himself boxed in. Fortunately, John Whetton of Great Britain generously moved aside. In the back straight Snell made his move, passing first Witold Baran of Poland and then Davies to take the lead. As he came to the last bend, and again as the straight opened, Snell glanced back to see he was leading by a reasonable margin. He eventually won by 15 m.
Snell’s time of 3 minutes 38.1 seconds was 2.5 seconds outside the world record held by the previous Olympic champion, Australian Herb Elliott. Following the race Elliott’s coach, Percy Cerutty, criticised Snell for not trying to ‘smash the world record’. But Snell was not disappointed – he had run to win. Snell’s team-mate Davies very nearly won silver. He finished with the same time as Josef Odlozil, but was awarded bronze as the Czechoslovak was judged to be fractionally ahead. It was still a triumphant day for New Zealand – the first time two of its flags had been raised in an Olympic medal ceremony. Snell retired from competitive athletics in 1965 and moved to the United States in 1971. He trained as a doctor, specialising in exercise physiology, and became an Associate Professor at the Southwestern Medical Centre, University of Texas. He remains the only man since 1920 to have won the 800 m and the 1500 m at the same Olympic Games. Three women have performed this double since a 1500-m race was added to their Olympic programme in 1972: Tatyana Kazankina of the Soviet Union at Montreal in 1976, Russian Svetlana Masterkova at Atlanta in 1996, and Great Britain’s Kelly Holmes at Athens in 2004. We have 8 biographies, 7 articles, related to Peter Snell wins second gold in Tokyo.